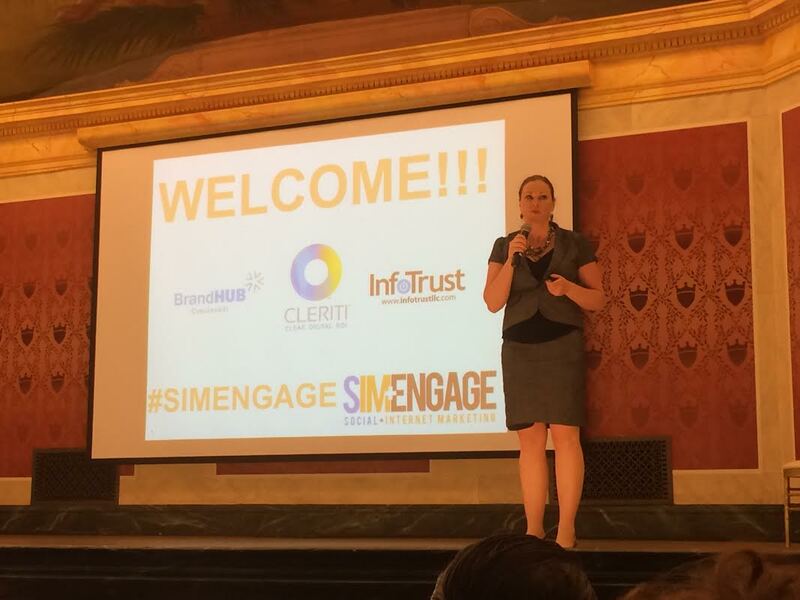 Krista Neher of Boot Camp Digital welcomes participants to the first SIMEngage conference in Cincinnati. Krista and others helped us better understand the convergence of earned, owned and paid media. After hearing Jason Falls‘ opening keynote talk at the SIMEngage (Social + Internet Marketing) conference May 15 at Memorial Hall in Cincinnati, I remarked to a colleague that I had already gotten my money’s worth. Falls, a true social media marketing pioneer, spoke about the convergence of PR, Content Marketing and Social Media, with Search Engine Optimization (SEO) and Word of Mouth (WOM) in the middle — and the tremendous opportunity this presents for organizations to achieve their strategic goals. He started with a quick explanation of SEO, and how Google crawls pages searching for keywords. The most relevant content comes up first, based on 200-some factors. Moving up in search rankings is our role, helping boost rankings in search engines. An old goal with SEO was getting more inbound links to your website, using tactics such as online press releases with links. This still helps, but two years ago Google changed the ranking system. SEO has become an earned media approach. You need to provide content that people care about. Become a thought leader. Create great, unique content that resonates with your audience. Share content in social media. Promote it. Falls pointed out that social media ranks high in searches. Social profiles appear on front page of Google and Bing results. Social media directly impacts how websites rank, according to Google. Google+ might be relevant only for that reason. You have about seven seconds to win a customer. You must figure out your moments of truth. What are your audience members asking when they are getting ready to buy? When are they making decisions? What are they asking? When can you provide relevant content and engage them? This is important because Word of Mouth (WOM) marketing is 62% more effective than an ad! And media coverage, paid, etc. boost SEO and WOM. Gets people talking about you online and offline. What does it take to develop earned content that will drive your SEO? Creative content. A great user experience. Relationships and storytelling. A dash of technical geekery. What is great content — Original (from you), Simple, Valuable and Useful, Entertains, Emotional (laugh, cry). Above all the content must be relevant to your audience. Key considerations — Who is the audience you need to reach? Why will they care about you? What are you doing to earn their interest? What incentive do they have to share? Finding topics — Ask your sales team, Mine the buying cycle, Q/A sites like QuoraYahooAnswers, mine social media, follow industry and peers. Next: Answer questions with blog post, video… American Express Business Forum is a good example. Others: H&R Block and the American Moustache Institute to lobby Congress for $250 tax credit. The Stache Act. Million Moustache March, etc. Make your profile. Point: Got H&R block in conversation for men 24-30, and it worked.